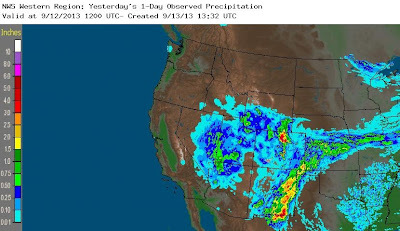 Big Rain in parts of the Western US this week, with the Four-Corner's States seeing the brunt of the precipitation all week long, in Arizona, Utah, New Mexico, and Colorado. Then the Front Range in Colorado was hit especially hard the last two days. The large area of Low pressure that has been hanging over Nevada, Utah, & Colorado this week is responsible. And that Low has circulated a lot of moist and unstable air up from Mexico and the Gulf, deluging many areas with record rainfall, along with resultant mudslides and flooding. In the 24 hour period from 6am Thursday Sept 12 to 6am Friday Sept 13 Burlington Colorado had 4.72 inches of rain. Centennial Airport had 2.44 inches, Colorado Springs 1.85 inches, and Denver Airport 1.30 inches. That's more than a whole summer's worth of rainfall for some of these places! Map above shows precip totals from Sept. 12. Southern Wyoming and into parts of Central Wyoming had between 3/4 and 1 inch of rainfall Thursday. Cheyenne 0.65 in. Lander 0.73 in. Laramie 0.91 inches. Northwestern Wyoming and Jackson Hole meanwhile measured rainfall in hundredths of an inch. So, no whining about how wet it seems we have been lately, compared to Colorado anyway. Total precipitation for June-July-August in the Town of Jackson was 1.65 inches. That is not even half of what our average summer precip would be, 3.85 inches. However, September has been a little wetter, as of Thursday, Sept. 12th, we have received just over 1 inch of rainfall during September 2013. Starting to make up for the generally dry summer. And a huge difference in teh weather from this time last year whe we were warm & dry and had the Little Horsethief Fire raging.